I was on the phone with a marketer friend; an expert who some of the biggest web companies in the world call for guidance on conversion optimization. To be completely honest, I’m surprised you’re getting any conversions at all. His feedback was grim, but it was clear. And I knew it was right. There’s no narrative, the messaging is all over the place and it doesn’t give me a single good reason to do business with you. Sometimes – at least for me – it takes having someone else say it to realize the truth that’s been right in front of me all along. On the product side, things were fantastic. 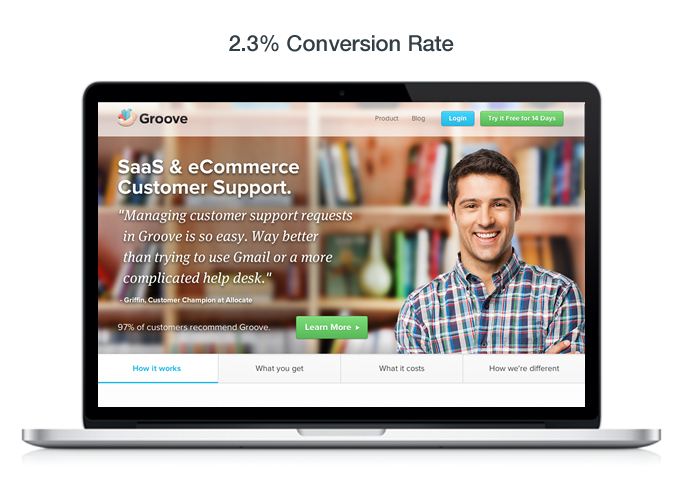 We had recently achieved Product/Market Fit, and our customers were loving Groove. On the marketing side, this blog was bringing us thousands of new visitors, but at 2.3%, our conversion rate was terrible. Of course, not all traffic is valuable. For plenty of people who read this blog or visit from Twitter or Hacker News, Groove is not the best solution. Only a fraction of our traffic consists of highly qualified prospects that we’re the right fit for, but we needed to do a much better job at reaching that segment. At 2.3%, we wouldn’t stay in business very long. We needed a big win. If we weren’t smarter than before, we were, without a doubt, more experienced. We knew how devastating it could be to jump into an overhaul blind. The last time we did that, it cost us six months and $50,000. This time, we were going to do our research first. We knew the site wasn’t performing, but in order to do better, we needed to figure out why. We started by reading everything we could get our hands on, online and off, about landing page design. Takeaway: Whenever I take on a project, I make it a point to always try and learn from people smarter and more experienced than myself. If you’re going to invest the time and resources to build a site, invest the time and resources to understand what works for others. It won’t all work for you, but it will pay off. Our next step was to go deeper into figuring out why our site was failing. To validate our quantitative results by getting qualitative feedback from people who knew what they were doing. We didn’t want to skew their feedback, so we didn’t tell them our conversion rates. Instead, we asked open-ended questions about what they thought of our site, based on their experience and expertise. The results weren’t pretty, but they were massively helpful. In short, our messaging and positioning were somewhere in the space between pretty awful and unbelievably awful. 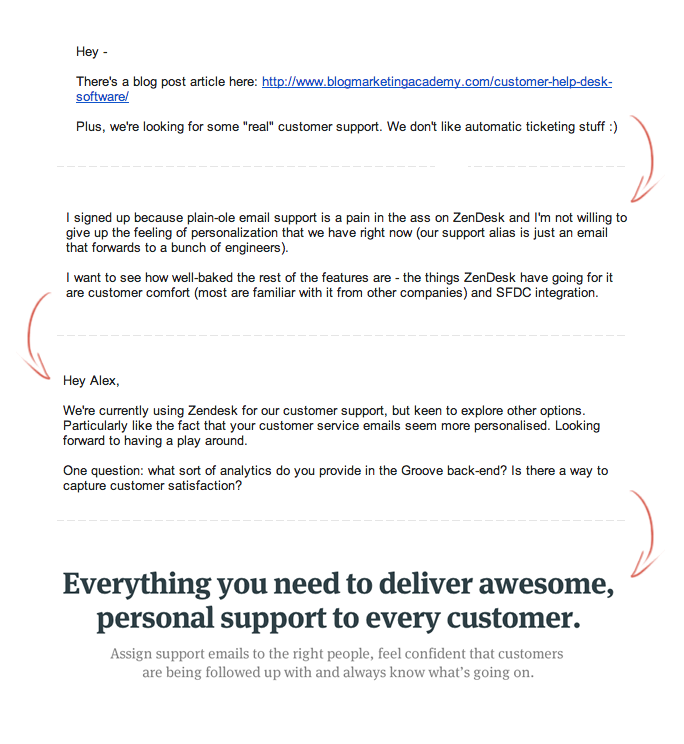 Customer support is a product, not a problem. What problem are you solving, exactly? You’re selling me on how easy it is to set up, but you haven’t even convinced me that I want to set it up yet. We were, to put it bluntly, missing the point. You’re talking to your customers the way you think marketers are supposed to talk. It’s marketing-speak, and people hate that. Nope, you should talk like your customers do. Takeaway: If you’ve been building relationships with people who know more about marketing than you do, there are few things more valuable you can ask for than expert feedback on your strategy. They may not have all of the answers, but you’ll have far more insight than you started with. We set out to learn, as our friends suggested, how our customers talked and what was most important to them. We set up a power report in KISSmetrics to identify our most engaged users: those who managed more than 40 emails per week. And then we picked up the phone. We knew that if we really wanted to get the insight we needed – not data, but words – the best way to do that would be through having actual conversations with our customers. Through phone calls and Skype, we asked our power users a set of probing questions, designed to not only help us understand their problems and what they loved and hated about Groove, but to give us deep insights into the exact words they used to describe those things. 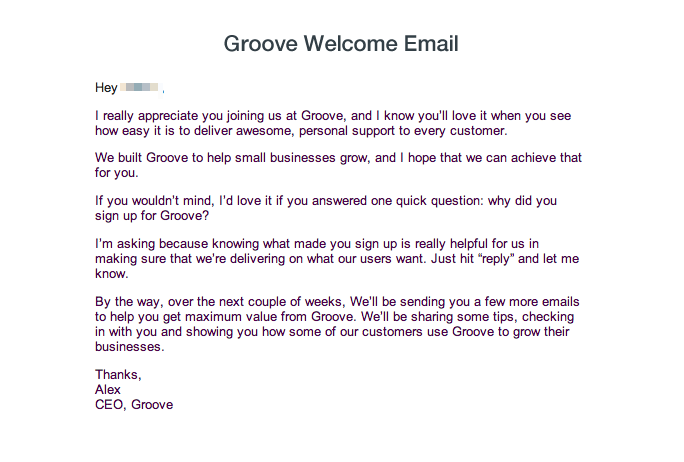 What problems were you hoping Groove would solve when you signed up? What was getting started with Groove like? What was your aha moment — the moment you knew you loved Groove? You can find notes from one of our calls, including the responses from a customer (with identifying data scrubbed), here. Not only were the responses that we got full of surprises for us, but many of them would become the foundation of our messaging for the new site. Takeaway: Your customers can teach you more about marketing your business than anyone. Ask them lots of questions and look for trends in the responses; if you’re hearing the same things over and over again, it’s probably worth focusing on in your marketing. We knew what our customers were thinking, but we wanted to go deeper into the “decision triggers” that made people sign up for Groove. If we learned exactly why people signed up while the decision was still fresh in their mind, we would know which positioning and messaging we would need to focus on to elicit the same behavior from others. As we learned in our previous customer development campaigns, sometimes the best way to get an answer to a question is just to ask. Just like our customer surveys, the answers we’ve gotten from this question have had a massive impact on our marketing. Interestingly, we found that the answers to this question varies widely between customers who answer it immediately after signup, and those who have been using Groove for a week or longer. After a few days, the responses begin to skew more toward specific features within the app. For that reason, we felt it was important to ask the question right away, so that the decision was still fresh in the user’s mind. Takeaway: Figuring out what drives your customers to buy is a lot easier than you might think. All you have to do is ask; immediately after signup is best. While the most important thing would be to develop messaging around our customers, we also wanted to make sure we were building Groove to be the business that we wanted, too. On the advice of one of the entrepreneurs we had talked to in our initial research stages, we decided to interview ourselves. The exercise we did was very similar to the one we performed when we were figuring out what this blog was going to be: everyone on the Groove team answered a set of questions that we designed to help us not only figure out who we were, but whether we were all on the same page about it. You can find these questions – and steal them for your own brand development efforts – here. This exercise was invaluable. The conversations that it started and the conclusions it led to helped our team grow closer and more cohesive than we’ve ever been. Armed with our research, our customer insights and our own answers, we started to build. Takeaway: Before you can tell your story, you have to internalize it. It sounds simple, but a basic exercise like the one above can bring your team closer together and make you much more prepared to talk about your business. In every prior iteration of our site, we put aesthetics first. More than anything, it needed to “look” nice. We would build designs, draft copy, and then cut or rewrite our words to fit the design. Looking back, this was insane. Not only was it expensive – changing text in HTML is much easier than re-doing design – it forced us to compromise on the single most important asset of our site: our message. We were painting our house before we built it. This time, we took a different approach. We took the data that we got from our reading, our expert feedback, our customer conversations and our own introspection, and we thought about how we would tell the right story this time, based on what our findings were telling us. 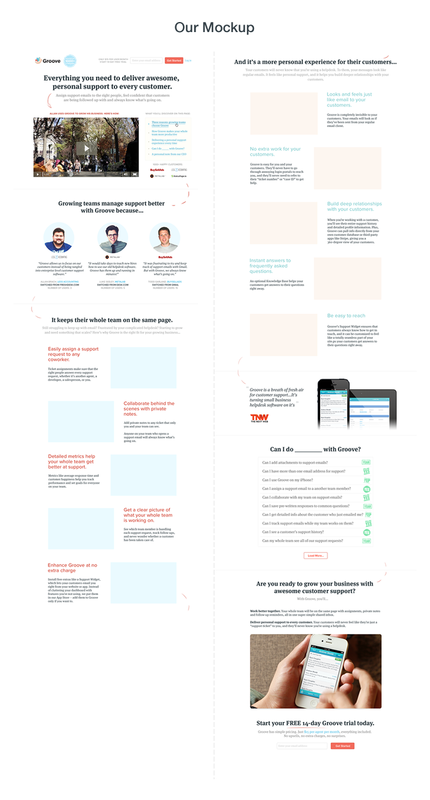 We knew that we wanted to try a long-form landing page, but that was about it. And while we wanted copy to be the lead here, we found it very hard to simply write without any structure. So, using Balsamiq, we built a very basic wireframe of a long-form page, guided by design elements from sites that we liked (and knew converted well), like CrazyEgg’s and a 2011 sales page for Highrise from the team at Basecamp (formerly 37Signals), among others. Most importantly, we didn’t wed ourselves to this layout. We simply used it as a guide, knowing that it was flexible and fluid, and that we would shape it around the copy we wrote. And then we wrote that copy. Pages and pages and pages of it, using everything we learned in the weeks before. We also knew that we wanted customer stories to feature prominently on our site. We wanted people to be able to visualize themselves in the shoes of a Groove customer, reaping all of the benefits of doing business with us. So while we wrote, we asked our friend (and Groove customer) Allan Branch at LessFilms if he would help us with a testimonial video featuring his SaaS business, LessAccounting. In just a few days, they produced a brilliant piece for our homepage. We wanted the site to feel like a conversation with the reader, so as we wrote, we read it out loud to each other, hundreds of times. We wrote two totally separate narratives around the problems that our customers faced. We chose the two we did based on the trends in our customer feedback. Within each one, we wrote dozens of headline and copy variations to test. It took us writing fifty headlines to come up with just five to test. We led with benefits, not features. With focused on real problems that we solved rather than vague descriptions of Groove’s use cases. 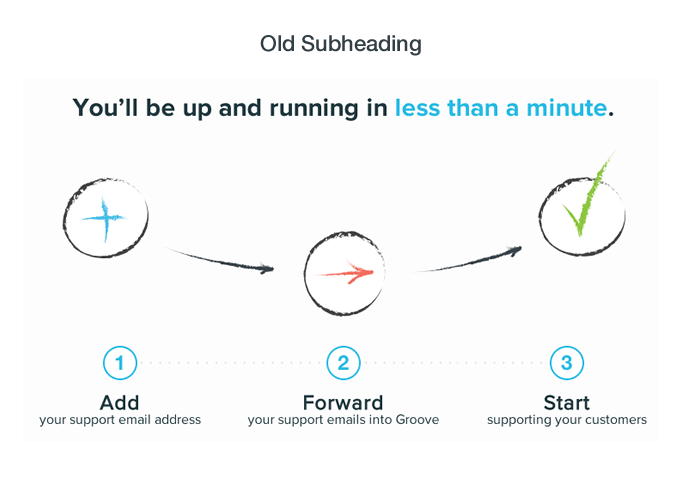 We tried to show exactly why Groove was the best option to solve our reader’s problem. We included validation elements and multiple calls to action. We spent days crafting the way we presented our offer. We edited, cut and rewrote nearly everything until we were satisfied that we had something we could build: finally, a starting point. And only then did we start to design. 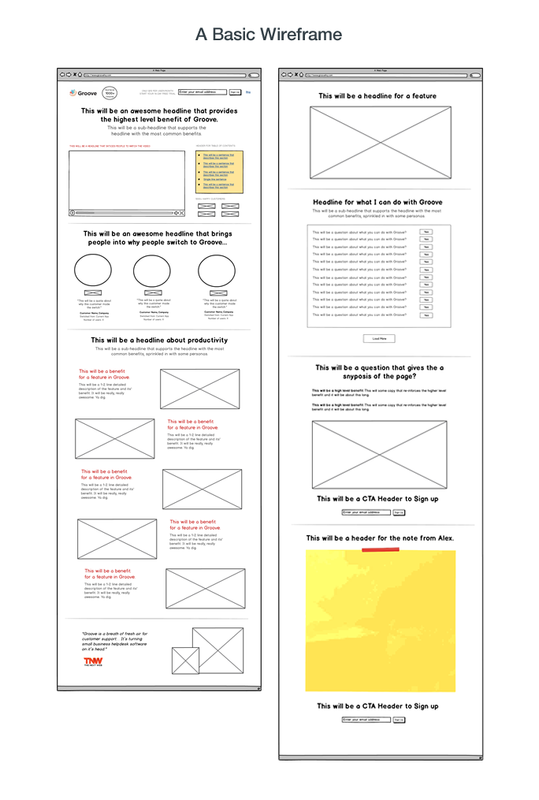 We bended and rearranged our wireframe to fit the copy we had written, and then we built a mockup from that. We weren’t interested in spending months – or even weeks – designing and developing before launch. We would sacrifice perfection in the name of “shipping it,” and four days later, we had a working prototype that we were ready to test. Takeaway: I’m not disparaging good design; hell, I obsess over the stuff. But focusing on design at the expense of content can be deadly. To find a balance, we had to reverse course and put design in the back seat, taking a “copy-first” approach. It may sound anti-climactic, but “launch day” didn’t really mean much of anything for us. Our data was far from statistically significant, and it took about ten days to finally get viable numbers. But once we did, the results were incredible. Our conversion rate, previously 2.3%, was now 4.3%. Over the following weeks, our tests and tweaks drove conversions up to nearly 4.7%, where we hover today. There are still many stones left unturned. We have hundreds of tests left to run, and lots of insights left to gain. We’ve installed Qualaroo and are already getting hundreds of valuable responses as to why visitors aren’t converting. 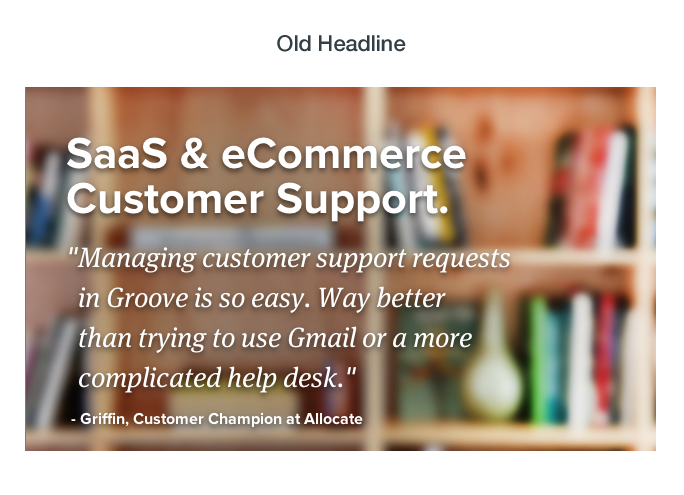 We’re continuing to A/B test headlines, subheads, images and calls to action using Optimizely. 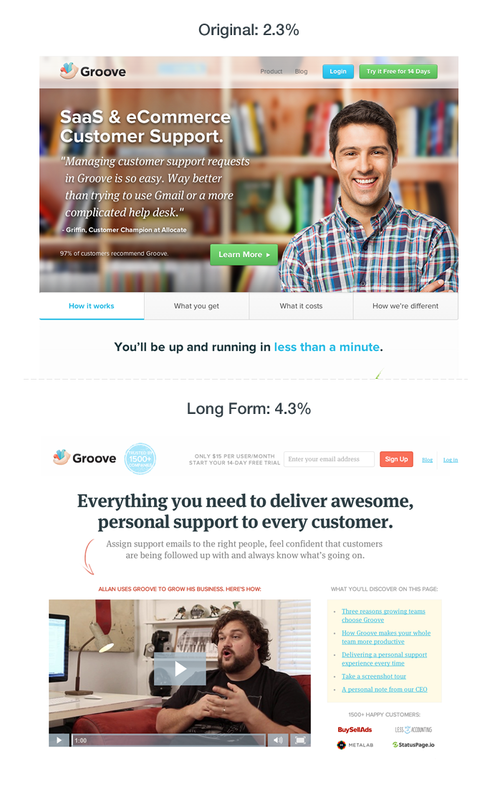 We’re wrapping up a short-form landing page to test versus the existing long-form one. Personally, I’m most excited about this test. Takeaway: Design and development are processes, not events. You’re only done when you’re ready to stop growing your business. There’s always more to test and tune. This post was by no means an exhaustive list of everything we considered and tried in our site development. That would be too long and too boring to publish. Nor is it an “ultimate guide” or end-to-end “how to” for landing page design. It’s simply a story about what worked for us in achieving our conversion rate gains, along with a set of key takeaways with ideas to try in your own business. If you’re struggling with an under-performing site, use the above exercises to help you think about how to find a breakthrough. If your site is doing well, try some of the tactics (like the welcome email) to make your business even more successful. Above all, I hope you’ve learned that talking to people – experts, customers, prospects, coworkers – is the most important thing you can do, not only in your design, but in your business. It will shape marketing, product, strategy and just about everything else. I challenge you, whatever stage you’re in, to go and ask lots of questions, and then listen carefully. What you learn could completely change your business.